Waterford Healing Arts Trust, with festival partners Garter Lane Arts Centre and Waterford City and County Libraries, is delighted to announce the programme for Well Festival of Arts and Wellbeing 2018. The festival takes place Monday 8 to Saturday 13 October, throughout Waterford City and County, and features an exciting line-up of 49 fun, inventive and sociable arts events for all ages. In this, its sixth year, the festival presents musicians, artists, poets, storytellers, theatre makers and filmmakers from home and abroad, and an extended programme of Wellies, the festival’s events for younger audiences. 46 out of the Well Festival’s 49 events this year are free, as a result of its funding from the Arts Council, Waterford City and County Council and Sanofi. Further details from www.wellwaterford.com and follow the Well Festival on Facebook, Twitter and Instagram. Well Festival of Arts and Wellbeing champions and celebrates the health benefits of participation in the arts by everyone. Each day of this year’s festival, Waterford people will have the opportunity to witness colourful, beautiful, thought-provoking music, art, theatre, film, poetry and literature and to experience the joy of creativity through dance and traditional song sessions, creative writing and art workshops and wellbeing events for all ages. Events take place at University Hospital Waterford, Garter Lane Arts Centre and Waterford Libraries thoughout the city and county, including Central Library, Brown’s Road, Carrickphierish and Ardkeen, as well as Cappoquin, Portlaw, Lismore, Dungarvan, Tramore, Tallow and Kilmacthomas libraries. The Well Festival also takes place in The Book Centre, Goma Gallery of Modern Art, The Granary Café and The People’s Park. 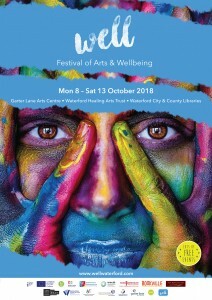 Highlights of the Well Festival of Arts and Wellbeing 2018 programme include the Women’s Creative Café, an evening of insights, reflections, connections and stories; an exciting collaboration between Cork Printmakers and the Italian National Association of Contemporary Engravers; beautiful, thought-provoking visual art exhibitions by Caroline Hyland, Eleanor Horan and John Gallagher, and members of Waterford Healing Arts Trust’s Open Studio and the Activation Therapy Unit at St Otteran’s Hospital; The festival also features Best Foot Forward, a gentle movement class for people over 50; daily lunchtime live music sessions in the foyer of University Hospital Waterford (UHW); a book club social with well-known storyteller Niall de Burca; Stars at Night, a night-time installation of star lanterns in the grounds of UHW; a workshop for musicians working in palliative care; and the ever-popular festival flagship event We haven’t had an earthquake lately, with guest MC, Edward Denniston, Poet-in-Residence at Waterford Healing Arts Trust (WHAT)/UHW. For children, the extended Wellies programme includes theatre for tiny audiences, storytelling in the Paediatric Ward at UHW, music, art, yoga, singing and writing workshops and, to celebrate International Day of the Girl, an exciting conference to engage girls and young women, featuring a stellar line-up of inspirational role models. Debbie Johnston, from Waterford City and County Libraries, said “We are particularly pleased this year to be able to present events in every library in the county, so Waterford people from near and far can enjoy this year’s Well Festival. There’s a historic tour of Portlaw, one of the jewels in Ireland’s crown, a fun nature walk for children at The People’s Park with the legendary Paddy Dwan of Time Outside Nature Walks, and we’re really looking forward to bringing the charismatic Niall de Burca to Tramore Library for our Book Club Social”. Sile Penkert, Executive Director of Garter Lane Arts Centre, added “We are very grateful to our funders the Arts Council and Waterford City and County Council, and our major sponsor Sanofi, whose support not only allows us to present Well each year, but this year enables us to offer 46 of our 49 events free of charge. So we invite people of all ages and from all walks of life to join us for Well 2018 and experience firsthand how good it feels to get involved in the arts”.